A candle making activity was organized on 16th January on the occasion of Makar Sankranti by Mumbai Smiles Foundation in collaboration with Asha Mahila Sangh at Kamathipura. The intention of this activity is to strengthen the relationship with local NGOs at Kamathipura and to interact with the victims of human trafficking. Our Community Health project objective is to help these women develop an interest in candle making. 90 beneficiaries were present during the activity. After the introduction of the team, Mrs. Smita Shivtarkar taught the art of candle making to the beneficiaries by way of a demo and explained the process of candle making. After the activity was completed they were informed that if they are able to acquire this skill then they can be self-employed and even receive an income. The importance of regular attendance in the training was emphasized upon. 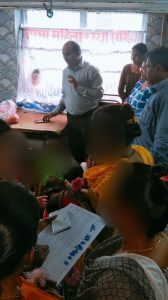 Mumbai Smiles through this activity offers an alternate source of income to the trafficked women and gives them a choice to decide their future.